A few people have enquired recently about our MoleyX project, as things have been rather quiet for a little while. I, myself, have been really slack. I now have two little Moleys here, on the kitchen table (don't worry, I don't eat or drink at the kitchen table, there's no room to do anything like that). I'm embarrassed to say that I've had Gabi's Moley since I made this drawing back in November. That's it, there on the top of the pile. I am going to get down to some work on it. I am. Really, I am. I'll also be posting some photos from France's Moley, which arrived at my house this morning. It is both beautiful and intimidating at the same time. So check out the MoleyX12 blog over the next few days to see some fabulous new work. I just can't tell you how gorgeous these books are. 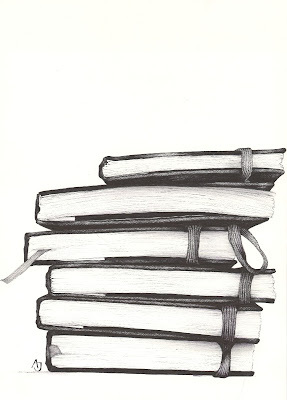 i would love to get my hands on this stack of moleskines! I still love that picture! Isn't it incredible how judgemental we're capable of being about every inch of ourselves though? a fellow blogger recently sent me a favourite blog award. details are on my latest post on my blog (the rules and stuff). the idea is that you nominate 8 other blogs you like. and then they in turn do the same. i thought it was such a lovely idea... and have picked you fantastic blog as one of mine. hope you like. and keep up the fantastic work. which is such a constant daily inspiration for me. I love the detail, you made them very realistic, the texture looks like you should be able to feel it. Love your work! As Joe said, would love to see what's going on inside of those! Also checked out the Japanese style moleskine exchange blog you linked to: very cool stuff there. Also wanted to let you know that I posted about you on a little blog of mine, drawninblack.com. I hope you don't mind! Yep, Andrea, i still have one sitting on my desk from last summer. Mea culpa. Damn, it looks like Chris Hack beat me to it. I, too, have given you an award, but maybe it is a very different award. Please come over to my blog to check it out and learn all about it. I thought this was a photograph until I noticed your initials! Awesome!